Smoke is a by-product of combustion. Smoke might contain any number of an incredible array of ingredients. The chemical composition of smoke, and its degree of toxicity, depends on many factors, such as the substance being burned, the temperature at which it is burning, and the availability of oxygen. Many of the substances that can be found in smokes are toxic - and smoke inhalation is the commonest cause of death in indoor fires. Of course, some smokes are much more harmful than others - but even "ordinary" wood smoke, in use since ancient times, may be harmful. (source - http://erj.ersjournals.com/cgi/content/full/27/3/446 ) Some of the particles in smoke are visible to the eye, and some are not - and this depends largely on their particle size. Depending on what is being burned, some examples of substances that might be found in smoke are:soot (carbon), nitrogen oxides, hydrogen cyanide, polynuclear aromatic hydrocarbons (PAHs), thiols, formaldehyde, ketones, carboxylic acids, halocarbons, terpenes, carbon monoxide, phosgenes and methoxy phenols. Doesn't sound much like a recipe you really want to ingest, does it? However, combustion also produces gases - and an air purifier that has to deal with smoke not only needs to be able to trap very fine solid particles, but also gaseous substances. This is a reason why many air purifiers contain both HEPA and activated carbon filters. Some common causes of smoke might be tobacco smoking, bonfires, wood or coal fires lit for the purpose of keeping warm, traffic fumes, wildfires, house fires and... burnt toast. 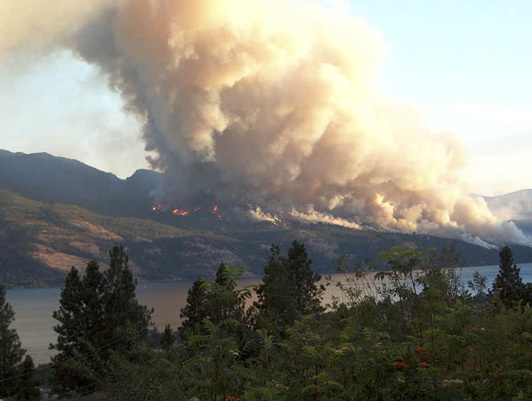 Image of a wildfire. It's crazy to think that often one tiny spark or flame might be all that is required to start something like this. It pays to be careful - especially in the dry season.